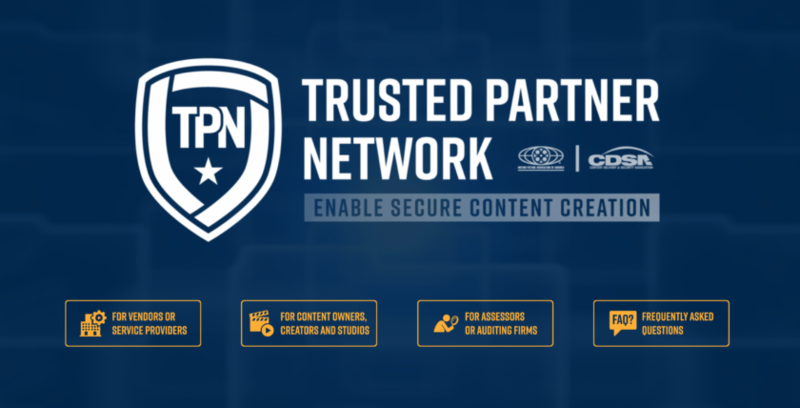 The Trusted Partner Network (TPN), an industry security consortium of 28 media and entertainment companies represented by the MPAA and CDSA, has announced the 2019 launch of its new Application & Cloud Security Initiative, which will work with technology vendors and their customers to identify and prevent application, device, storage and workflow vulnerabilities. TPN was launched last April to create a collaborative platform for preventing leaks, breaches and hacks of film and television content by elevating the security standards of the industry’s production and distribution supply chain. This Phase II of TPN’s development follows the success of the program’s initial vendor site security program, which already involves over 500 industry-leading facilities and service providers worldwide. The TPN provides vendors with a voluntary, cost-effective way to assess the security preparedness of their facilities, staffs, workflows and products against industry best practices. Vendors who complete a TPN assessment are published in the Vendor Roster directory on the TPN platform that is accessible to content owners and producers worldwide. TPN’s App & Cloud Security control framework is scheduled to be completed before the end of 2018; roll-out of the new assessment programs, training curriculum and recruitment of qualified assessors are scheduled to take place during Q2 of 2019. The final program will fully integrate with the TPN Vendor Roster so that automated vulnerability alerts can be addressed to all relevant facilities when they are first identified. For more information about TPN, please visit www.ttpn.org.